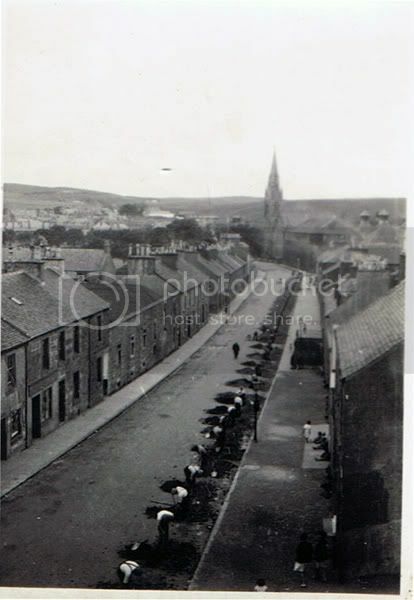 We received this absolute cracking photo of Saddell Street showing the whole street in its former glory! Anyone have any idea when this photo was taken and what the men are doing? With thanks to TR and CL. At a guess,late 40s early 50s.,and can only assume they are digging the ditch for electricity/gas/sewage ? The children are fair interested in what they are doing.Strange not to see a single car or lorry . Note that most of the men in the photo are working. There seems to be only one fellow in charge, the one in the middle of the road..
Nowadays there would be 4 well-dressed fellows studying plans, another 5 on their mobiles and mebbe one actually working! I think I'd put the time as much earlier than the 50's though. Did naebdy notice the flyin saucer? I just thought it was that day's scheduled airship heading for Machrihanish. Sorry to drag an old post up, but what happened to the big church spire that you can see at the end of the road, what is it now ? Looking on Google it looks like it was where the Tesco is now, so what was there before Tesco and why would they demolish a church ? Anyone shed any light on it. It was the Lochend Church. Yes, it was demolished. I am sure that it was the result of a dwindling congregation and the cost of upkeep. You will find more about it onthe forum, particulrly the windows which are now installed in New Zealand. I think the very top stone of the spire is lying at McFadyens yard in Glebe Street. Just as a matter of interest, does anyone know of the whereabouts of the WW1 Memorial plaque that was in the Lochend Church? Odds;Here is a link to a picture of Lochend church from the historic Kintyre site.The second link is to a picture of the fantastic stained glass window.